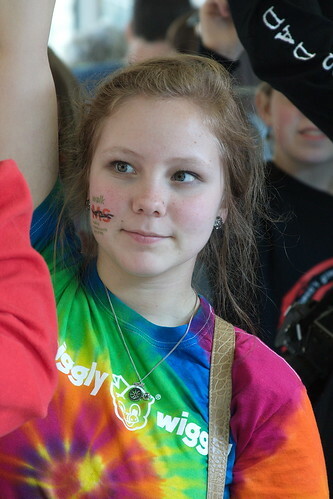 Kelsey at Walk MS 2012, a photo by The Bacher Family on Flickr. I love buses. They're filled with windows that let indirect sunlight in on all sides, turning them into one large circular softbox with people inside. Great for portrait lighting! In this case, Kelsey added to her attractiveness (from a photographic standpoint) by wearing a bright shirt that adds a nice splash of color to the picture, and by getting a temporary "walk ms" tatoo on her cheek to set the context of the photo. Frame the image tightly, use a shallow depth of field, and get lucky with a short enough exposure to freeze the action on the bumpy bus ride, and voila, a beautiful portrait! 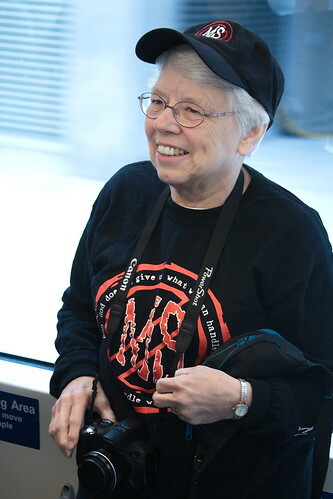 Here's a similar portrait, under similar conditions, of my mother -- in this case, on the bus ride to the walk in the morning light.